Fiscal note on SB 22, tax cut bill, is out … and it’s a doozy! The fiscal note for SB 22, the so-called “windfall” tax bill being pushed by Senate President Wagle (R-Wichita) is out and it’s big. Passage of SB 22 would strip about $400 million out of the state treasury in three years – $191 million in 2020 alone. The issue is relatively simple to understand. When Congress, with the full support of all six conservative Republican members of the Kansas delegation, passed the Trump tax bill they simply ignored the fact that their huge tax break for the wealthy would result in a state tax hike for average Kansans. By raising the standard deduction in the federal tax code, they wiped out itemization for most middle-income taxpayers. And since the state and federal codes are “coupled,” that means that if you can’t itemize on your federal taxes, you can’t itemize on your state taxes. Thus state taxes for most middle-income earners went up. The Department of Revenue released three hypothetical Kansas taxpayers (married filing jointly with 2 children and a federal adjusted gross income of $120,000; married filing jointly with no children and a federal AGI of $60,000; and married filing jointly with one child and a federal AGI of $60,000). In those three scenarios, the first taxpayer with the AGI of $120,000 saw an increase of $39 in state taxes due to the federal law while the other two saw an increase of $12. That state tax increase was not passed by the Kansas legislature but instead by Trump and the congressional Republicans. Kansas Republicans are aghast and seek to immediately decouple from the federal tax code to prevent this increase. Wagle wants to do this so quickly that she formed a special committee in the Senate naming herself as chair to get it out of committee this week. Today the Kansas Chamber and some corporate tax advisers talked to the committee about provisions in the bill that would exempt corporations from paying state taxes on overseas earnings that are “repatriated” to the U.S.
KNEA is neutral on the policy – whether or not to adjust the Kansas tax code to deal with the unintended consequences of rushed tax changes by Congress is a decision the Legislature should debate. But we are not neutral on the impact. If a bill is passed that strips nearly $200 million out of the treasury in one year with more than $100 million per year lost in the following two years, how does the Legislature plan to pass a responsible budget that funds our schools and restores service cuts across agencies? And perhaps that is the point. We all know what happens when tax policy is done in a rush! Trump and his supporters in the House and Senate in Congress rammed through their tax bill without having any idea of its impact and the harm it might do to middle income taxpayers. Sam Brownback and his allies rammed through a tax bill in 2012 that brought Kansas to the brink of collapse. So here’s our plea. Stop the rush! Be deliberate; consider the consequences of each change; look for alternative ways to address the issue without decoupling. Try exercising a little restraint. SB 22 will strip too much money out of the Kansas treasury while we are still in recovery from the Brownback disaster. As today was “Kansas Day,” it was a perfect time to celebrate all that makes our state great, including the dedicated professionals who work so hard to make sure our kids are safe, learning and growing in our public school classrooms. 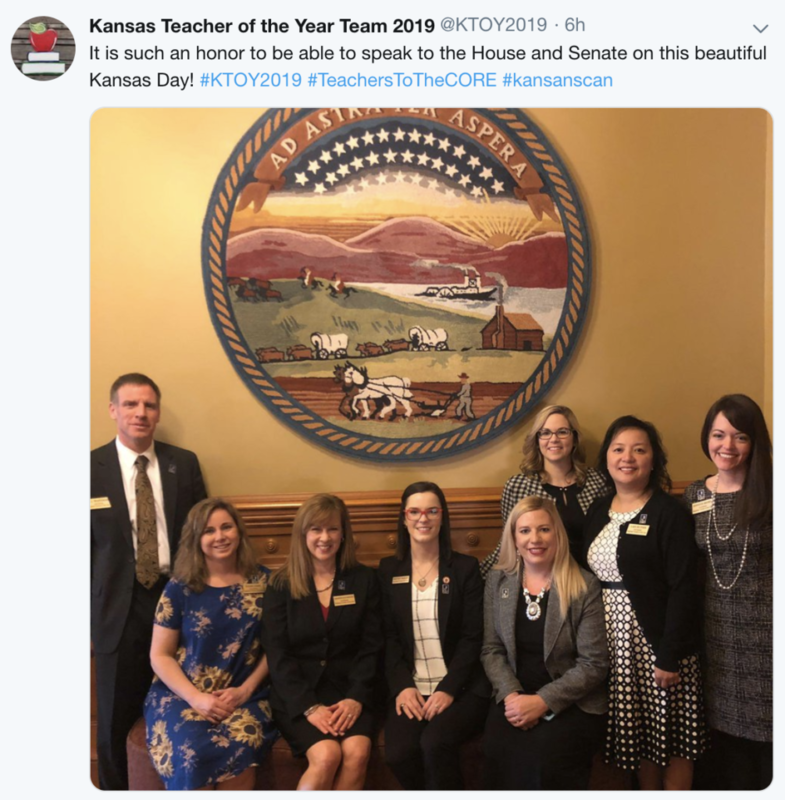 The 2019 Kansas Teacher of the Year team is recognized for its members’ outstanding contributions to their students, but also works to be a strong voice for educators during the year. Today, the team addressed a joint House and Senate Education Committee to bring both their optimism and concerns before our state representatives. 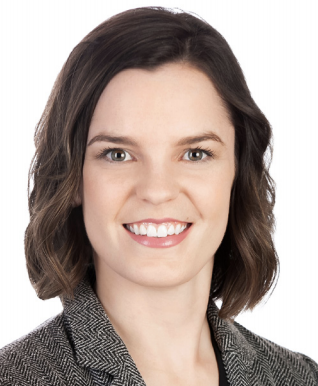 The 2019 Kansas Teacher of the Year, Whitney Morgan shared some of what she believes would be beneficial for students including embracing diversity, targeted interventions, smaller class sizes and professional development. Whitney teaches English and English for speakers of other languages in Kansas City, Kansas. 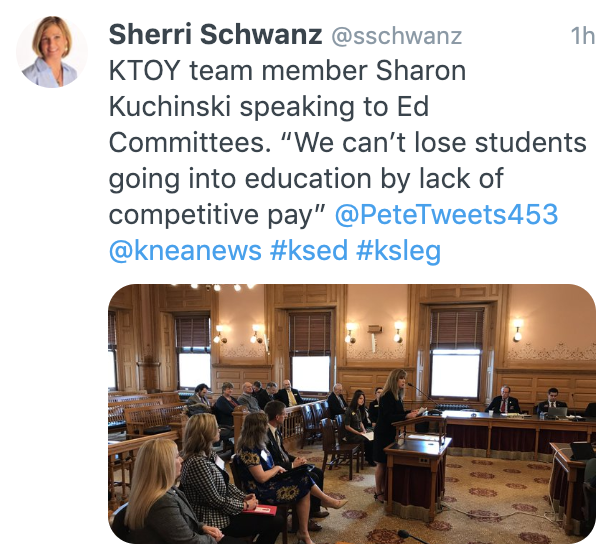 Team member Sharon Kuchinski, a high school social studies teacher from Leavenworth, gave some very strong testimony over concerns for the difficulty our state is facing attracting new teachers to the profession, particularly when many teachers- but certainly early career educators- are faced with working multiple jobs in order to make ends meet. 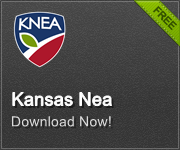 We applaud the Kansas Teacher of the Year team for their efforts and advocacy. The team will continue to meet with various groups throughout the state, including Kansas NEA, to share their insights throughout the coming days and weeks. We look forward to hearing and learning from them.